Ball. Ball? Ballballballlballball. Ball. Ball. Ball, and ball. Ball, ball, ball, ball? Ball. Treat? Sit? Ball. Ball, ball, ball, ball.... BALL! Do you see my ball? Here is my ball. Ball. Ball? Can you throw it? Throw it. Throw it! THROWITNOWPLEASE! Blue ball. Orange ball. Tennis ball. ALL THE BALLS! Ball. Ball. Ball blue. Ball orange. Ball tennis. Fetch? Fetch! FETCH! Ball. Ball. Ballballballballballball. Ball. Ball. Yep. That's right. I learned how to drive. I mean, after all, I'm like 35 in dog years. It was about time my mom let me. My friend, Greg, came over to our house, and Layla and Bogart had to stay outside because I'm the best. Obviously. And then they let me take the wheel! My friend, Chantal made sure I didn't hit anything, and our neighbors even came out to watch. And I was in two videos! Check them out! My first vine appearance! Where are you going Finley? My YouTube Premiere! Planet of the Pups - Dogs have taken over, and they now own their humans! Mum- take me to the dmv! I think I could get my license. Are thumbs required? We love pupsicles in August, and that’s why we repost this recipe every summer. I mean, what's better for a pup in the spring than an afternoon in the yard chasing squirrels and enjoying a pupsicle afterwards?! No really, pupsicles are an easy dog treat that that hoomans can make with just a blender or food processor. And the homemade version is much more economical than the ones available in the freezer aisle of your local grocery store. You'll also need some common tools from your kitchen like a rubber spatula and a spoon. Note: My hoomans buy the cheapest products possible in my local stores. There are easy ways to upgrade your pupsicles depending on your pup's tastes or needs: Greek yogurt, chunky peanut butter, etc. You will need lids for your plastic containers, although they are not pictured here. Caution: Some peanut butters contain the artificial sweetener xylitol which is extremely toxic for dogs. Check the ingredients! Blend until thoroughly combined and smooth. The color should look similar to that shown below. You can add some water if you want to stretch the recipe a little bit. Spoon/pour the mixture evenly into the plastic containers. These are treats. They should not be served as a meal. Carefully check the yogurt and peanut butter to make sure neither contain ingredients that are toxic for dogs. Supervise your dog until he/she has finished his/her pupsicle. Do not let your dog eat the plastic containers. Bogart loved his first pupsicle! He's an expert pupsicle-eater now. My hoomans are always on weird diets, and I don't really understand, but my mum says that nutrition is important, even for pups. In my opinion, we should just be allowed to eat pancakes all the time. What's so wrong with that? 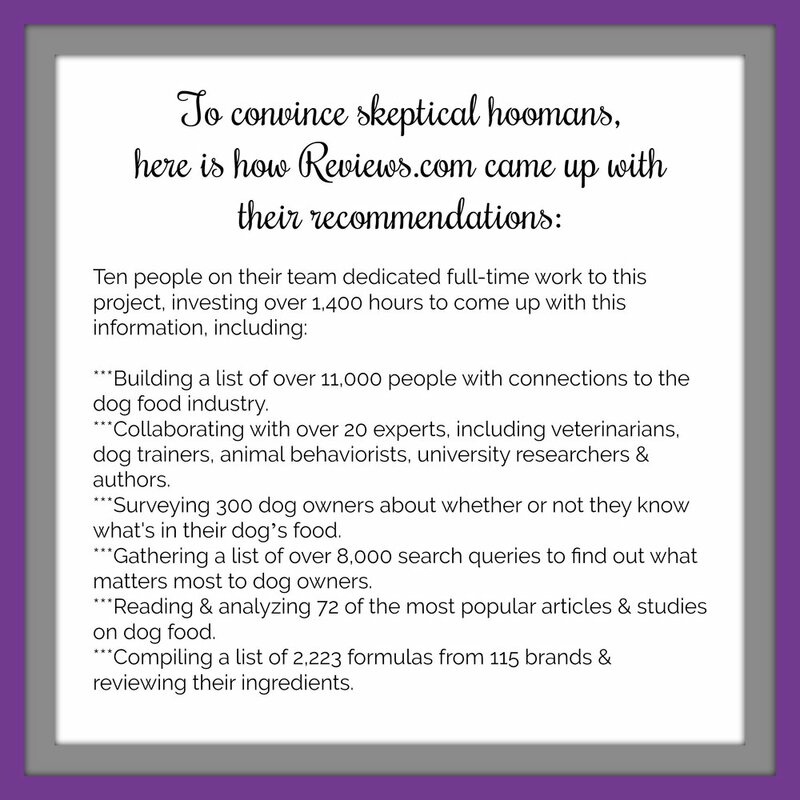 So, anyway, our friends at Reviews.com asked us to share their research about what to look for in dog food. My mum says that there are lot of recalls of dog food and that she would be really sad if she fed us bad dog food on accident. For us, two-thirds of our food is Taste of the Wild, and--since we're spoiled--the other third is homemade. (The recipe is, for now, top-secret.) Anyway, it doesn't really matter too much to me which brand other pups prefer, but there are some ingredients hoomans should look at. Click the image to read the full report! Stay safe and happy chowin'!